Borderlands 2 has gone gold, which isn’t a phrase you really hear any more these days. 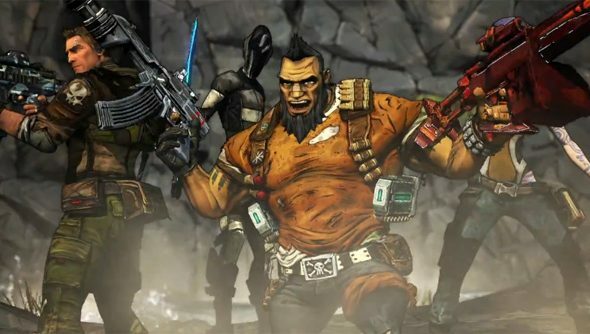 It means it’s done, that it exists in a form that is pleasing to Gearbox CEO Randy Pitchford. I can picture him now, arms folded, silently appraising the post-apocalyptic sequel before giving an almost imperceptible nod to and underling, who prints out all the game code, and shoves it into a pneumatic tube marked ‘Microsoft/Sony’s arcane certification barracks, plus wonderful, democratic PC land’. This is how games development works, I think. Randy tweeted the news late last night, adding that Gearbox are now focusing on developing the game’s DLC. Namely, the excellently named Mechromancer character class, which is free to anybody who pre-orders the game. Borderlands 2 launches September 21st.